Osteoarthritis is a painful, often debilitating disease that is the most common form of arthritis, affecting millions of people worldwide - and with no discrimination when it comes to age. Although osteoarthritis can damage any joint in your body, the disease most commonly affects the weight-bearing joints in your hands, knees, hips and spine. Osteoarthritis symptoms often develop gradually and include Pain, tenderness, swelling and stiffness, loss of flexibility, hearing or feeling a grating sensation when the joint is used. The joints in the body are connected by a firm, fibrous connective tissue called Articular Cartilage. Articular Cartilage functions as a shock absorber and, if healthy, helps to facilitate smooth joint motion, allowing bones to glide over one another with minimal friction. Osteoarthritis occurs when the cartilage wears down. Without the protection of Articular Cartilage bone rubs against bone. There are several causes as to why the cartilage may start to break down. It can and commonly does occur with age, but the cartilage may also become damaged as the result of an injury. In addition, a genetic predisposition can cause osteoarthritis. Being overweight is another contributing factor as it increases the risk of cartilage wearing down in the hip, knee, and ankle joints. Also, fractures may bring about the onset, or long-term overuse from sports or other athletic activities. Osteoarthritis is a degenerative disease for which there is no cure. As the disease advances in severity, the density of the existing cartilage becomes thinner until it wears out completely. At this point, many sufferers seek surgery as the primary solution to the distress they experience. However, there are alternative treatments to the discomfort and oftentimes lengthy recovery period following surgery that can relieve the symptoms of pain and stiffness. One such option is massage therapy. Chronic osteoarthritis has been shown to respond well to massage, which aids in decreasing pain, and increasing mobility. Massage is a safe, non-invasive, drug-free, all natural alternative for those suffering from osteoarthritis. Massage not only relieves the pain associated with osteoarthritis but can also improve flexibility and mobility in the affected areas. Massage encourages and increases the flow of blood, promoting oxygen to help heal the afflicted area. Additionally, massage can eliminate the toxins and inflammatory substances that have built up in the area, as well as decrease stress and instill a feeling of wellbeing. There are many forms of massage, each with its own set of benefits. These include Trigger point, Reiki, Shiatsu, Swedish, and Reflexology. At Academy Massage, our therapists are trained to utilize the technique best suited to your specific condition. Our therapists also encourage a proactive health program that includes a healthy diet, drinking plenty of fluids and following a proper regular exercise schedule, all of which are intended to allow you to manage and overcome the pain and the strain of osteoarthritis and enjoy the full strength and potential of your body. As every fan knows, football is a high-impact contact and collision sport that often results in injuries ranging from mild (strains and sprains) to severe (broken bones, concussion). From the training grounds to the playing field, the football player frequently pushes his body past the point of endurance and may end up paying a penalty for his rough and tumble action. As a preventive measure, a performance enhancer, and an aid in the recovery process following an injury or trauma, many footballers turn to Sports Massage. Geared specifically to the athlete, this type of massage focuses on muscles that have undergone a large degree of stress and use, often to the point of overuse through repetitive and aggressive movement as part of the overall sport or competition. Sports massage is usually very deep and concentrates on those muscles that will be functioning the most strenuously during the game. The massage increases blood flow circulation and heightens muscle tone, enabling the joints and muscles to move with greater flexibility. Massage flushes and keeps muscles maintained and in good shape, leading to quicker recovery and increased training potential, which helps to promote a better athlete. Sports Massage can help sore muscles that have become fatigued; this in addition to identifying specifics concerning the athlete's gait, posture and other problems that may affect his performance during training or on the field. 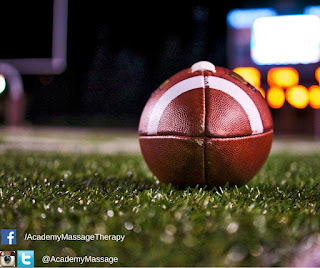 Massage benefits football players by offering techniques to keep the athlete at optimal all 'round health which is important considering the duration of the football season, which begins in summer and progresses through fall and into winter where increased risk for colds, flu and overall general low energy exists. Finally, massage can have important benefits when it comes to the player's psychological preparation, which is just as vital to the game as is physical stamina. Massage allows the player to relax, decreasing stress and pre-game anxiety and even permitting visualization for a positive outcome to the competition. Due to its proven effectiveness Sports Massage has been recognized by many teams as an accepted component to an overall regimen of training and competition. Winnipeg is a city that champions our sports teams. Whether the game is played professionally or at an amateur level, one thing remains consistent: Athletes demand optimal performance. At Academy Massage, we support and cheer our athletes and our qualified massage therapists are on hand to help you perform at your best. Pre-game or post-game or to restore to health those joints and muscles that have been compromised on the playing field, we encourage you to speak with our experienced staff to discuss the various healing, enhancement and preventive therapies Academy Massage offers to help keep you fit and active in your sport.